This page is about the anthropologist. For the maker of clothes, see Levi Strauss. In 2008, he became the first member of the Académie française to reach the age of 100 and one of the few living authors to have his works published in the Bibliothèque de la Pléiade. French President Nicolas Sarkozy described him as "one of the greatest ethnologists of all time". 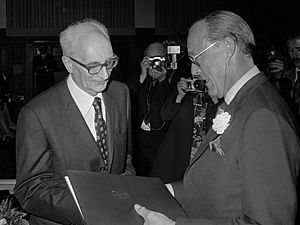 Bernard Kouchner, the French Foreign Minister, said Lévi-Strauss "broke with an ethnocentric vision of history and humanity [...] At a time when we are trying to give meaning to globalisation, to build a fairer and more humane world, I would like Claude Lévi-Strauss's universal echo to resonate more strongly". Claude Lévi-Strauss Facts for Kids. Kiddle Encyclopedia.